Batting around and scoring nine runs in the bottom of the first inning, Dat’s Your Problem then fended off the Lady Pirates who scored in the next three innings, for a 15-9, Sunday afternoon victory in the Virgin Islands Baseball Softball Association Harriette Skelton League at the E. Walwyn Brewely Softball Park in Road Town. The Lady Pirates pulled within 9-7 in the top of the third inning before Dat’s Your Problem added three runs in the bottom of the inning and another three in the bottom of the fourth to give Shakira Skelton the victory. Javelyn Frett took the loss. Lady Pirates’ manager Devon Bedford said his team has been struggling with injuries and missing players since the start of the league and since the second game, they haven’t had a full team on the field. 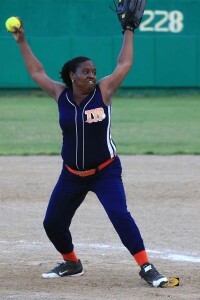 Tamara “Tammy” Phillips of Dat’s Your Problem, was 3-for-4 as the top hitter. She scored twice and had 2 RBI’s. Dat’s Your Problem was coming off Friday night’s 14-1 triumph over the West End Warriors, in a game that Tualia Nibbs-Henley, fired a 2-hitter. It wasn’t a good weekend for the Warriors, as Darier Malone tossed a one hitter against them during a 10-0 Saturday night white wash. Sarah Washington was the losing hurler. League leaders Power Outage improved to 10-1, with an 8-0 victory over the Mobsters. The Mobsters also lost to the Pirates 13-3, before the Pirates fell to the A’s, 5-3, to close out play on Sunday night.